Grace Kelly is a blazing wonder, jet-surfing on the night, powered by music; singing, dancing, and playing her saxophone in an exuberant explosion of creativity and brilliance. Her original compositions and interpretations of jazz classics and rock songs are all marked with a scintillating sense of spontaneity, deep feelings, and tremendous freedom. The concert last night at the Tel Aviv Jazz Festival, with Kyle Hawkins (keyboards) and Philip Lam (drums), was her first ever performance in Israel, hopefully, the first of many to come in future years. She lights up the stage with her vivacious presence, igniting a bright warmth that resonates throughout the concert hall. Grace Kelly’s show is called a “Joy Party” – and if you were there last night, you know why. Green hair flying, dancing in her red boots, Grace Kelly opened with a cover of Unchain My Heart that was a joyful paean to freedom as she sang in her clear, high voice or played sax with body and soul, dancing, jumping, swinging. 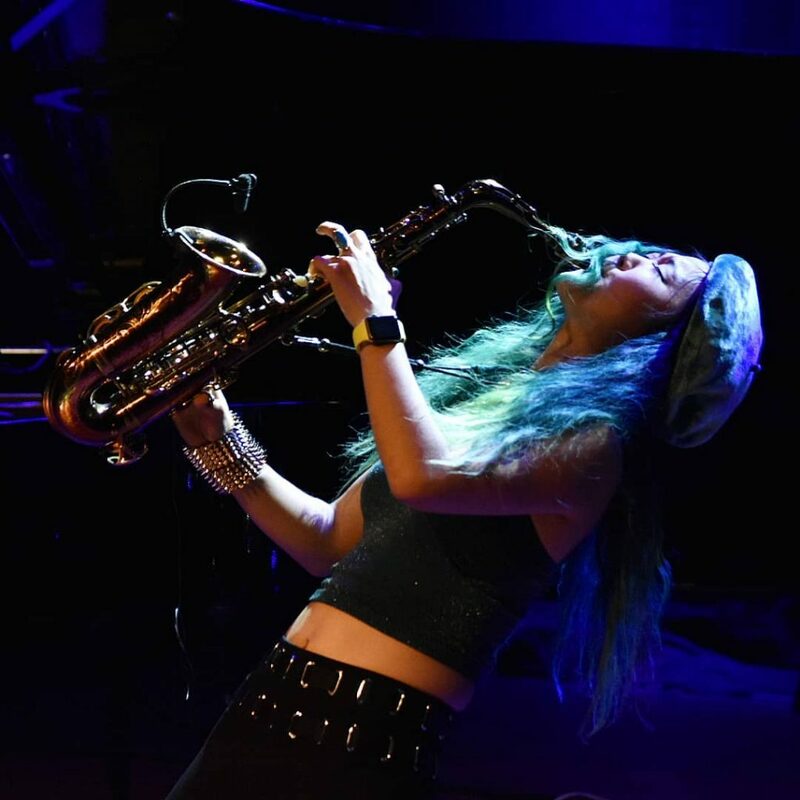 She is the queen of head-banging sax! It was an amazing set, rising from one peak to another, flying high. The very well-named Wonder Woman is a bright piece, flowing with cool confidence, an air of intrigue, and great vibes. Listening one could easily visualize Grace Kelly’s description of imagining women superheroes flying through the sky, holding musical instruments. What could possibly follow that? A very moving, intense version of Johnny Nash’s I Can See Clearly Now, with an ethereal, mystical feel. Grace Kelly closed the concert with two original songs: Feels Like Home and Lemons Make Lemonade. Feels Like Home captures the buoyant excitement of love, that floating feeling, in a song infused with a trace of country. Lemons Make Lemonade was inspired by musician and bandleader Jon Batiste, in whose band Grace Kelly performed on the Late Show with Stephen Colbert. Batiste was featured on the album recording (Trying to Figure it Out, 2016) of this song. It’s a celebration, a marvelous, swinging, joyous song that had the audience swaying and clapping along right from the start. Hearing it live was an incredible experience as Grace Kelly danced right off the stage, along the front row and up the isles, singing to everyone she met along the way. Onstage again, she led the audience in singing along with her, saying: “Nobody warned me… nobody warned me you had voices like angels.” Music flows from this artist like waves of love and light, in every mood, rhythm and hue, touching everyone with the wonder of it all.